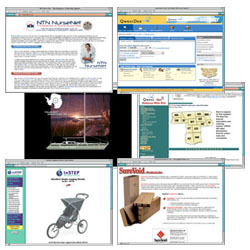 WebbResources is a web design and applications development firm, serving clients around the United States. We develop, host, maintain and promote high quality Web sites designed to meet the specific needs of our clients. While virtually every company can benefit in some way by doing business on the Internet, most business owners do not understand the unique requirements of creating an effective web presence. There are literally thousands of web sites entering and exiting the marketplace on a daily basis. The vast majority of failures are a result of an invalid marketing strategy, an inefficient development process, poor design, or a combination of these factors. Too often, business owners become overwhelmed by the glamour of doing business on-line, resulting in an ineffective and discouraging start into this exciting new medium. Like any marketing venture, developing an effective Internet Marketing Program requires a thorough understanding of the basic principles of marketing. But one must also understand the principles of Internet marketing specifically. While this new medium shares many of the principles of effective marketing through other mediums, it has many characteristics that make it unique. Creating an effective Web presence is much more complicated than simply creating a fancy site with "bells & whistles", images & icons, movies & sounds, etc. Like other methods of marketing, an Internet Program must be developed with a thorough understanding of the overall business objectives of the business owner. Without this important foundation, it will be ineffective at best, and potentially destructive at worst. To be successful, a Web site should conform to the Keys to Effective Site Design. It must also fit into the overall scheme of the business owner's long term objectives. Evaluating your own objectives and learning to effectively apply them to this exciting new medium is half the battle. If your company goal is to boost sales, reduce costs, enhance communication or expand your market, WebbResources can help you to accomplish these goals. We work with our clients throughout the development process to create a Web site that meets your requirements. Request a bid on your upcoming development projects. Location is not a limitation. With good communication most development can be accomplished without ever meeting in person. Whether you're just now entering this exciting marketing arena or if you need to update your current website, you can request additional information through our Contact Us or Quote Request pages. Or, send an email to Jack Webb, President of WebbResources to discuss the details of your development project. In most cases, you will receive a reply the same day.